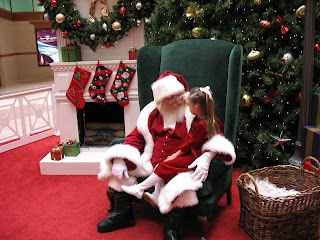 We went to Lakeline Mall this morning to sit on Santa's lap. Jaeden was so happy to see him and tell him exactly what she wanted. Avery however has never looked so scared and held on to me for dear life. She wanted nothing to do with him. We'll have to try again next year. That was a real nice picture. She looks so cute. Those pictures are SO cute! 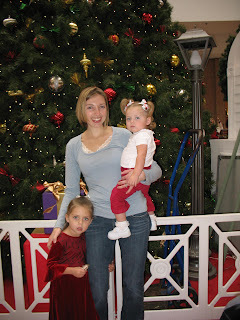 I remember when we did Santa when the kids were babies at Barton Creek mall. Angie you look soooo skinny!! I mean I know that you are skinny, but you look extra skinny!! "Eat papa eat!" Love ya!